Do you like my ghost design? 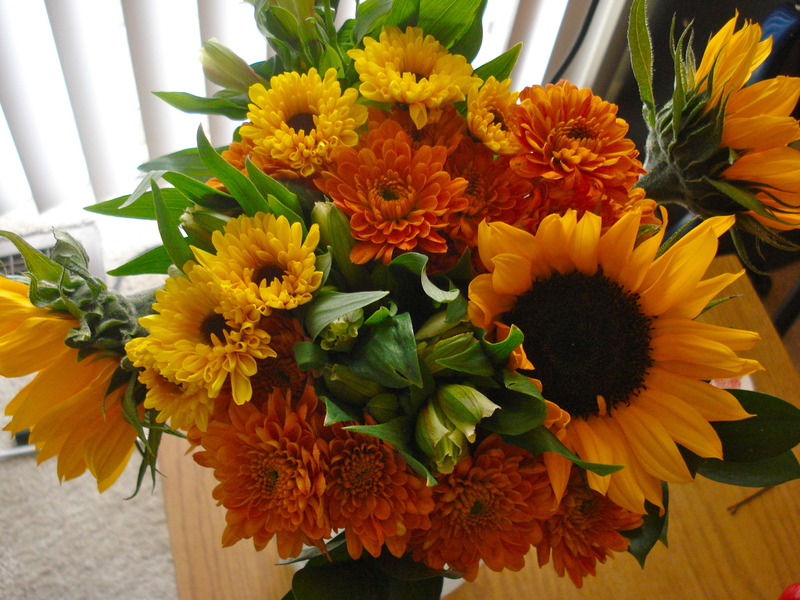 My Halloween started off on a wonderful note last night when I came home to a package on my doorstep … and when I opened it up, I found the most beautiful bouquet of autumn flowers that my dad had sent to me for Halloween! It was such a sweet surprise! My dad always makes me feel so special and loved. I am a very lucky daughter. Now I get a huge smile on my face every time I look across the living room and see them on the table, brightening up the room! The best part about these cupcakes is the homemade chocolate frosting. I found the recipe on AllRecipes.com and tweaked it a little bit to use less butter but still taste rich and creamy. This frosting is a guaranteed way to make a box-mix cupcake taste gourmet and super special! These cupcakes could be decorated for any holiday or special occasion. I chose to decorate mine with candy corn for Halloween. 1. Preheat oven to 350 degrees. Prepare a cupcake tin with liners and set aside. 2. Bake cupcakes according to package directions. I combined my yellow cake mix with the eggs, water, and oil and beat with a whisk until the ingredients were well combined and the batter was smooth. 3. Fill each cupcake tin 3/4 of the way full and bake for 20-25 minutes, until a toothpick inserted in the center comes out clean. 4. While cupcakes are baking, make the frosting. Melt butter in a small saucepan. Turn off the burner. Add cocoa powder and mix well; then stir in vanilla extract and cinnamon. 5. Pour sugar in to a large bowl. Add the chocolate mixture and the milk and stir until the frosting is smooth and creamy. It will be thick! You can add more milk or half-and-half if you would like it to be thinner. 6. 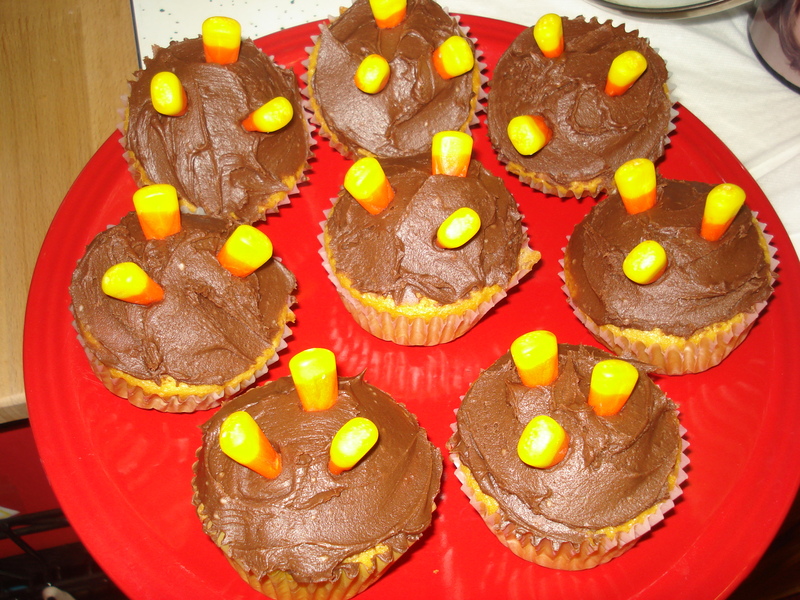 Once cupcakes have cooled completely, frost each one with a generous amount of chocolate frosting. 7. 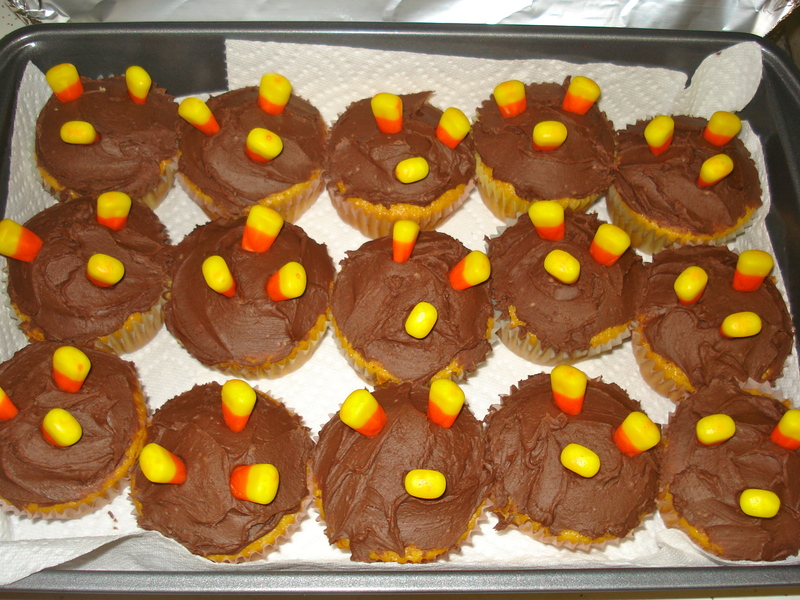 Stick 3-4 candy corn pieces into each cupcake so their tops stick out decoratively. Here they are all packed up and ready to go for my students! 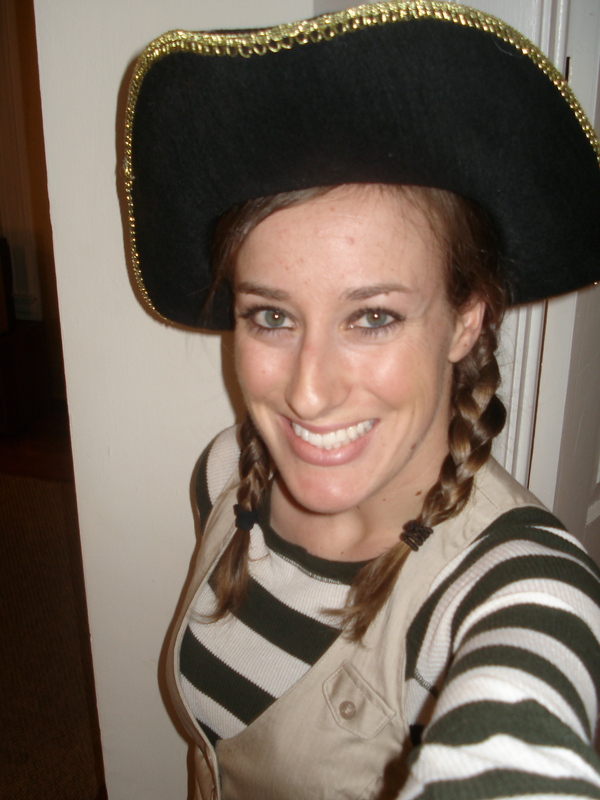 Inspired by Deme at Fresh Coat of Paint to make use of what you have, I used a striped shirt and vest I already owned to dress up as a pirate. Anyone else using what they already have to dress up? Anyone make a homemade costume? One of my favorite-ever costumes was when I was a little girl, maybe four or five years old, and my dad helped me hand-paint cardboard butterfly wings that we tied to my shoulders with pink shoelaces. It didn’t cost us a single penny and I had so much fun preparing my costume, and when I wore it trick-or-treating I felt like the prettiest little butterfly! I still remember it vividly to this day. One of my favorite parts of Halloween is seeing all the creative, innovative and funny costumes! 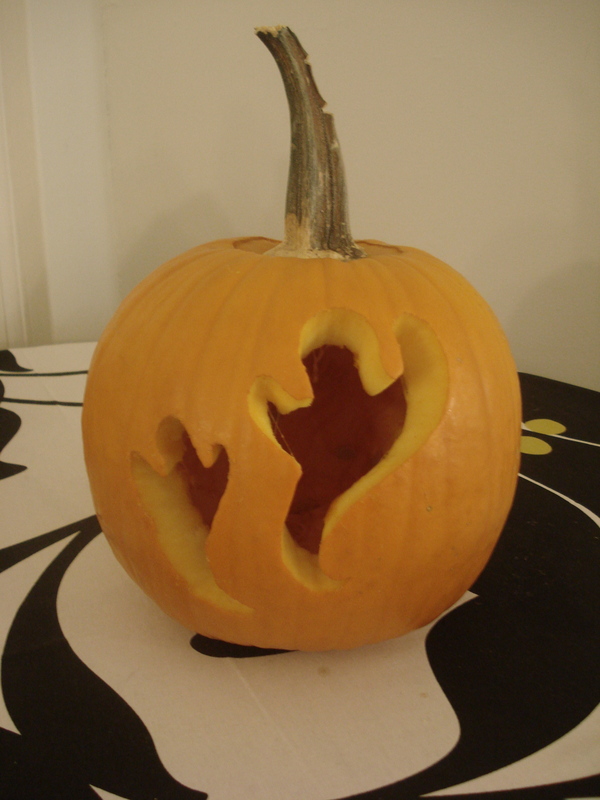 Hope you are having a wonderful Halloween full of creative costumes, fun activities, and yummy treats! What are you doing to celebrate today?